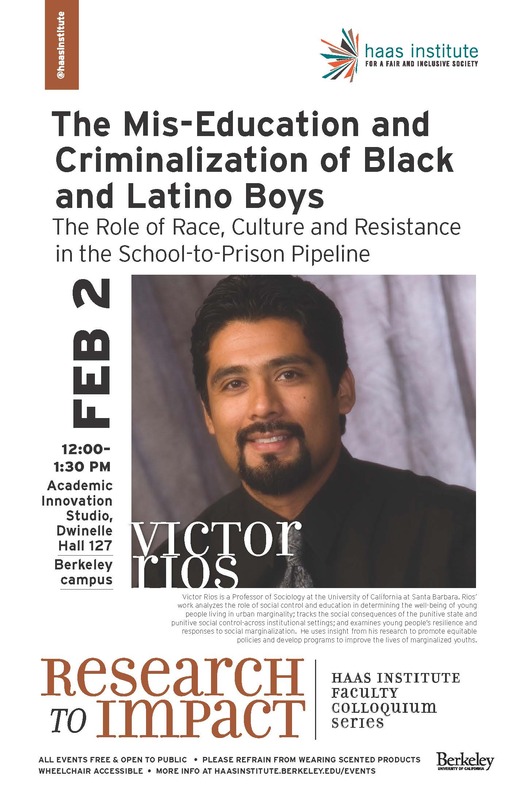 Victor Rios, Sociology Professor at UC Santa Barbara, visited UC Berkeley on February 2 to discuss the criminalization of Black and Latino boys, and his nearly 20 years of research examining the perspective of youth experiencing punitive social control on the streets and in schools. In the context of increased school policing, the militarization of urban neighborhoods, and the political demonizing of youth of color, his talk provided a critical humanist perspective. Drawing from his first book, Punished: Policing the Lives of Black and Latino Boys, which chronicles the adultification of children of color in the school-to-prison pipeline, and his recent book, Human Targets: Schools, Police, and the Criminalization of Latino Youth, Rios emphasized the need to move beyond describing the behaviors of marginalized young people in ways that dichotomize, distort, and deny the full range of their humanity. Rios used his recent work—a two-year school ethnography on classroom context, teacher supports, and the role of race—to illustrate how schools produce a “youth control complex” that strips Black and Latino male students of their dignity and devalues their perspectives. Referred to as “cultural misframing,” this institutional misreading of what boys and young men of color bring to the learning environment causes them to receive less emotional support. Based in part on the work of David Harding, UC Berkeley Associate Professor of Sociology and member of the Haas Institute Economic Disparities faculty research cluster, “cultural misframing” occurs when the positive cultural frames of Black and Latino boys are delegitimized, weakened, and denied support. According to Rios, misframing uses institutional power to harm, while ignoring the powerful cultural frames available to inspire and transform. How do we invest in the critical cultural frames of Black and Latino boys? Transforming educational systems and creating inclusive affirming learning environments are central to the Haas Institute’s Race, Diversity and Educational Policy faculty research cluster, and its focus on educational inequality, school reform, and inclusive learning environments that reflect diverse student perspectives. Equitable schooling can disrupt inequality by promoting upward social mobility and, when done with a spirit of inclusion, by affirming and strengthening the inherent gift, talents, and abilities of all students. Cultural misframing, however, belies the transformative function of education. Ultimately, what is needed are institutional practices that affirm the dignity of students, produce inclusive learning environments, and sustain a sense of belonging—from the teacher and their teaching philosophy, to the classroom and the motivating images that adorn the walls—they all matter, and communicate a message to students. Victor Rios, through his work, provides a living example to motivate us to look for opportunities to affirm, to co-create a sense of belonging, and to construct cultural frames that work to serve, rather than negate, Black and Latino students. This talk was a part of the Haas Institute's Research to Impact speaker series. Read more about the series here. Check back later for a transcript of this talk. Victor Rios is a Professor of Sociology at UC Santa Barbara. His work analyzes the role of social control and education in determining the well-being of young people living in urban marginality; tracks the social consequences of the punitive state and punitive social control-across institutional settings; and examines young people’s resilience and responses to social marginalization. He uses insight from his research to promote equitable policies and develop programs to improve the lives of marginalized youths.